Home /Blog/US government shutdown: Whats the impact? US government shutdown: Whats the impact? The partial US government shutdown has entered the new year as President Donald Trump’s border wall standoff with Congress remains unresolved. With federal closures now on day 12, around 800,000 employees are feeling the impacts of no funding and no pay. On Wednesday, Mr Trump insisted he would keep the government closed for “as long as it takes” to fund the border wall as he met top Democrats and Republicans at the White House. But the shutdown showed little signs of ending after lawmakers said they would return to the White House on Friday to continue negotiations. And as agencies drop all non-essential work, the consequences are wider-reaching than just quiet Washington DC streets and shuttered museums. Since 22 December, Americans nationwide have expressed their worry and anger over the situation, taking to social media to share how they cannot pay their bills or afford medication thanks to the shutdown. The partial shutdown means about 25% of the US federal government has no funding. Only essential employees will continue working, but they’ll do so without pay. Nine departments have been affected by the shutdown, including Homeland Security, Justice, Housing, Agriculture, Commerce, Interior, and the Treasury. Around 800,000 federal workers are now furloughed – that is, temporarily laid off due to a lack of funding – or working without pay. Many hope they will receive back pay when the government resumes, but that remains uncertain. Some have resorted to second jobs or fundraising to get by in the meantime. Employees have taken to Twitter to express their frustration over the shutdown, sharing financial difficulties with the hashtag #ShutdownStories. A worker’s union representing some 400,000 essential personnel on Monday filed a lawsuit against the Trump administration for allegedly violating the Fair Labour Standards Act by not paying these employees since 22 December. And the impact stretches beyond the capital city. In Indiana, the political standoff stopped US census work, with 40% of census bureau employees sent home without pay just after Christmas, according to the News and Tribune. The National Park Service has suspended all non-emergency services, including all visitor services like public toilets, waste pickup, road maintenance and support centres, with over 21,000 employees now furloughed. The parks remain generally accessible to the public, but conditions have deteriorated due to a lack of staff. 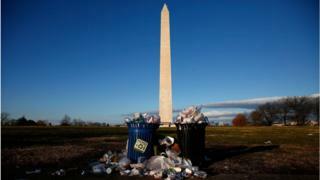 Noticeably, rubbish has begun to pile up outside national sites, including around the National Mall and the White House. The Los Angeles Times reported human waste has created a health hazard in Yosemite after visitors began using the roadside as a replacement for public toilets. And without snow ploughs or rangers to help handle wintry conditions, the Sequoia and Kings Canyon national parks in California have seen an increase in vehicle accidents due to dangerously icy roads. The lack of staff has also impacted visitor safety by way of rescues: One backpacker in Texas had to be carried for two hours by a single ranger after breaking his leg on a trail. In addition, any park-operated monuments and homes are also closed, including the Frederick Douglass Historic Site, Ford’s Theatre and Belmont-Paul Women’s Equality National Monument. As many federally employed scientists stop working at agencies like the National Science Foundation, labs across the country are facing repercussions. Researchers are concerned about their ability to access federal data and getting in touch with grant officials about project funding. Rush Holt, head of the American Association for the Advancement of Science, emphasised the impact in a statement. “Any shutdown of the federal government can disrupt or delay research projects, lead to uncertainty over new research, and reduce researcher access to agency data and infrastructure,” Mr Holt said. Tourists in DC will find all of the popular Smithsonian museums – like the Air and Space, African American History and Natural History museums – are now closed. The National Zoo and all live-animal broadcasts – panda cam included – are also offline. The animals will still be cared for, the Smithsonian said. Smithsonian spokeswoman Linda St Thomas told the BBC an estimated 1.2 million visitors will be turned away if the shutdown continues through January. She noted two thirds of Smithsonian employees are now furloughed. The National Arboretum and National Archives have also shuttered. The National Gallery of Art has managed to acquire enough funds to stay open until Thursday. Thanks to an earlier appropriations bill, the US Botanic Garden and Capitol Building are also open. Meanwhile, nonfederal museums remain open with some, like the Woodrow Wilson House, offering free admission to federal workers. Native American tribes receive substantial federal funding for essential services like healthcare and food as part of a deal negotiated decades ago in exchange for Native lands. In Michigan, a Chippewa tribe has already been forced to use their own funds to pay some $100,000 (£79,400) to keep clinics and food pantries open, the New York Times reported. Similar stories have cropped up across the country. Some Navajo tribes in New Mexico, Arizona and Utah are trapped in their homes without access to groceries and medicine due to unploughed roads. In Minnesota, police officers on the Boise Forte Indian Reservation are already working without pay. Washington DC’s local government is still operating, and has been reminding tourists that businesses and restaurants are also open for business. And many local spots are offering discounts to government employees to help ease the strain of the shutdown. Some bars in the capital began offering federal workers discounted drinks as soon as the shutdown began on 22 December. Celebrity chef José Andrés, who owns a number of restaurants in the Washington DC area, announced that federal employees and their families could get a free sandwich at any of his establishments throughout the shutdown. Italian restaurant Carmine’s will also be offering free food to workers. As Washington locals band together to address food concerns, the shutdown has also sparked national concerns over benefit programmes like food stamps. The Department of Agriculture confirmed eligible families would continue to receive food assistance in January, but some programmes will operate solely on state funding through the shutdown. The National Women, Infants and Children (WIC) Association, which provides food and education to low-income pregnant mothers and children, issued a statement urging lawmakers to end the shutdown before state agencies run out of funds. “Over seven million mothers, pregnant women, and children rely on WIC,” association president Rev Douglas Greenaway said. The shutdown has also made its mark on some late December weddings in Washington DC. One couple tweeted that their marriage remains unofficial since marriage bureau staff in the capital were furloughed during their wedding. But those hoping to file for divorce can still do so as the intake centre has stayed open, Buzzfeed News reported.